by Chad O’Carroll (NK News, 23 July 2013) Headline image by Koryo Tours. SEOUL – North Korea has added a chapter on Russian friendship to the Arirang Mass Games, a source who attended the show on Monday night told NK News. 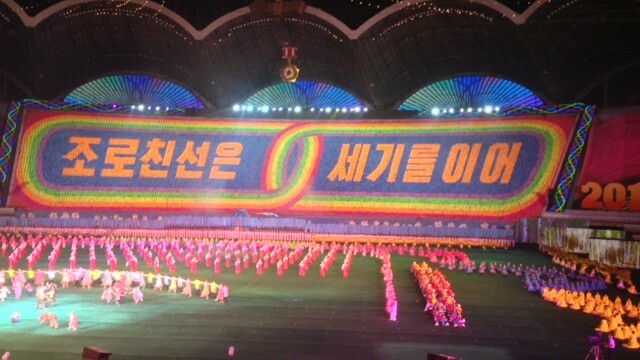 The new section includes a banner that says “Russian friendship [carries on] century by century” and represents the first time North Korea has included a section specifically focusing on relations with Russia during its Mass Games. “The role of the USSR in the liberation of Korea from Japanese colonial rule has always been acknowledged by Pyongyang. But with this news perhaps Pyongyang is trying to play the Russian card in its diplomatic game with China,” Dr. Leonid Petrov, a researcher at Australia National University told NK News. Before the collapse of the Soviet Union, North Korea often used its relationship between Moscow and Beijing to gain competing concessions from the two superpowers. Dr. Petrov speculates that following increasing reliance on China in recent years, the DPRK might now be using Arirang to fan a closer relationship with Russia. “Kim Jong Un desperately needs closer links with and more developmental aid from China. The best strategy in this game would be that he use the tried and tested policy of maintaining ‘equidistance’ from Beijing and Moscow,” Dr. Petrov explained via email. In addition to the new Russia chapter, the manner in which China was presented was also different, the source said. “The Chinese part was shortened this year, they still had the friendship section but it seemed a lot shorter. I didn’t see so much about the pandas last night,” the source told NK News after watching the inaugural show. The Mass games normally includes a major chapter on North Korea’s relationship with China, though experts had predicted it was likely this would change following an apparent “frosting” of diplomatic relations between Beijing and Pyongyang in recent months. “[North Korea has] been so angry with China this year, do they want to send a message to the Chinese by dropping the friendship chapter? Or if there is a big overhaul and thus a change in the narrative story of the performance, perhaps this is a good opportunity to drop the awkwardly placed chapter in a fairly natural way,” Andray Abrahamian, a Director at Chosun Exchange, told NK News. Another notable change to this year’s proceedings was the inclusion of a short chapter on North Korean relations with the entire world. The performers formed an olive branch, possibly as a metaphor of the country’s own self-professed willingness to seek better relations with the rest of the world. “It was very brief, just a glimpsing moment – but it was interesting and a change from last year,” the source told NK News. The theme of this year’s mass games is focused on the 60th anniversary of the Korean War (known as the Fatherland Liberation War in North Korea) and the 65th anniversary of the founding of the DPRK. The Arirang mass games, a 120,000 person gymnastic and artistic performance, started in 2002, and tells a “grand story of a divided peninsula and how North Korea became a dignified nation,” according to North Korean state media.